The Antarctic Tide Gauge (ATG) database is a database of ocean tide surface height harmonic coefficients (amplitude and phase) from a variety of measurement systems. These coefficients are primarily intended for users interested in validation of tide models for the Antarctic seas including the areas covered by the large floating ice shelves; see, e.g. King and Padman (2005). Data contributing to the ATG database vary widely in quality, from short records of unknown accuracy, to very precise, long-term records. This database provides sufficient information for a user to judge whether a tidal analysis at a particular site should be used for their application. 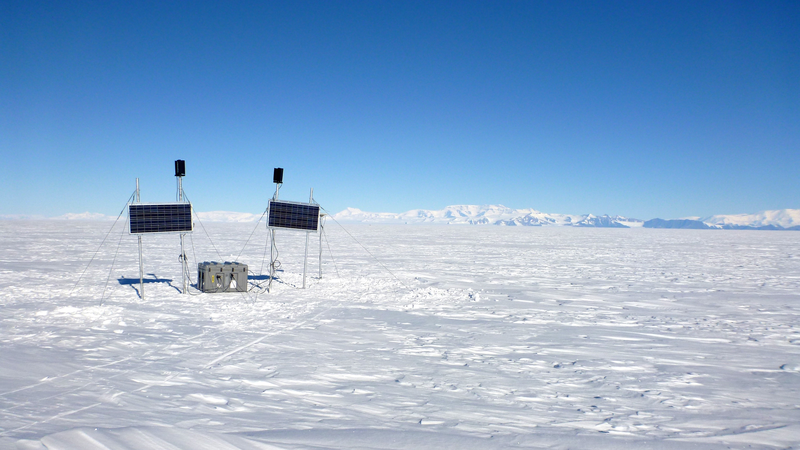 Continuous GPS station deployed on the southern Ross Ice Shelf . GPS receiver, electronics, and battery bank are housed in the gray box, with solar panels and wind turbines to recharge batteries. Photo by Matthew Siegfried, Jan 2014. Wire length loggers on ice shelves. The highest-quality data come from CTG, BPR and modern GPS records. The major tidal constituents are best separated if more than 1/2-year of data are available. Many Antarctic records are less than 29 days long, so that they are difficult to analyze for a sufficient number of major tides to develop reliable predictive models for that site. Nevertheless, because so few tide records exist in the region, these shorter records (and, of course, the intermediate-length records between 29 days and 1/2 year long) may be valuable to some users. Information on each site can be viewed by downloading our ATG KML package for Google Earth. Information can also be viewed and downloaded as a single file. Contact Laurie Padman (ESR; padman@esr.org) for more information, or to submit new datasets to the database.